Nature is prone to finding simple ways and would not complicate the human body without good reason. In infancy, buccal fatty bodies are needed to develop the sucking reflex and learn how to chew. Over time, the need for lumps of Bish disappears - the digestion of an adult does not suffer because of their removal. Thus, the operation of an adult does not harm the body, but only allows you to get rid of the children's rounded cheeks. Cheeks can be removed without surgery. With the development of sports culture and proper nutrition, more and more people are stating that it is possible to get rid of any flaw in the structure of the body by changing their lifestyle. Revising the diet will be beneficial if we are talking about fat deposition at the waist or hips. But Bish’s lumps are anatomical formation, protected from resorption by the buccal muscle and the superficial muscles of the face. Because of this arrangement, neither fasting nor grueling training will help to remove the roundness of the cheeks. The only way to eliminate the hated problem is the surgical removal of fat formation. Endoscopic removal of lumps of Bish is performed with penetration through the mucous membrane of the mouth and is used more often. 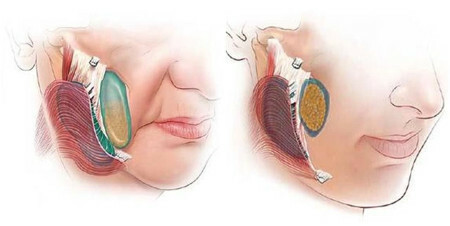 The external method is used in conjunction with other surgical anti-aging techniques. Bish’s lumps can be removed at any age. Since the growth of the body continues until the age of 25, the cheeks take on a final shape upon its attainment. In the process of growing up, the shape of the face may change, and the fat bodies decrease on their own. Therefore, surgery is not recommended for patients younger than 25 years old. Any surgical operation is a stress for the organism, therefore there are indications and contraindications for it. To remove lumps of Bish is recommended to chubby people with pronounced fat deposits in the cheek area. Also, the technique is used to eliminate defects that appear with age. It should not be removed by people suffering from chronic diseases of the oral cavity during an exacerbation, patients with oncology or bleeding disorders. Age-related changes are complex and affect all processes in the body. Facial aging is not only accompanied by a decrease in skin turgor and the appearance of wrinkles due to a decrease in the production of collagen and elastin. One of the reasons for the appearance of age-related changes is gravitational ptosis — the omission of tissues due to a decrease in the function of the aponeurotic system. As a result, the musculature of the face loses its tone and the soft tissues sag. Heavy Bish's lumps only accelerate this process, pulling the cheeks down. At the same time, folds appear on the neck, nasolabial folds become deeper, and ugly flecks form. Slowing down the ptosis and, as a result, aging, will help remove cheek fat. In the " Plastic and Cosmetic Surgery Center " in Poltava, help you get rid of unnecessary cheek fat and give your face a perfect shape.